Battle to dominate the game on the ball, and off the ball. Hawk-Eye has evolved since its last publication. Your team can now evolve too. 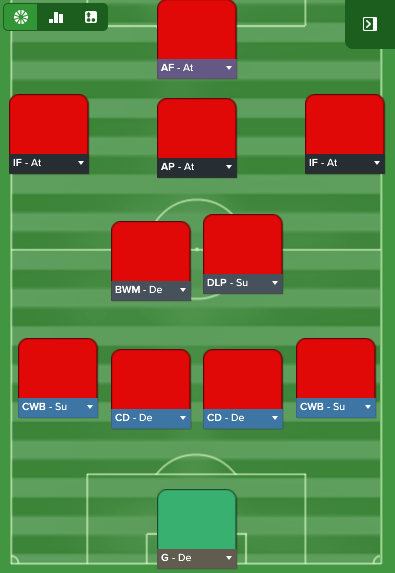 A defensive yet lethal tactic for FM 2017. I've had quite a bit of experience when it comes to creating tactical systems, and posting them online here. It all started with The Brendan Rodgers System. Two versions of this system, and a later addition named Poetry In Motion, marked the beginning of my tactical studies on the game. I studied how many of the top teams played their football, leading to the release of The José Mourinho System. I had created systems to replicate Pep Guardiola's philosophies at Bayern Munich, Sir Alex Ferguson's at Manchester United, but I never released this work. FM15 brought a new era for myself. I had begun to develop my own way of thinking tactically, and experimented heavily. I focused a lot on the defensive side of the game, but in such a manner which still allowed my team to hold considerable ball possession and be creative in attack. With that idea in mind, this brought me to the release of Hawk-Eye 4-3-3, a system which focused on possession with a cutting edge on the ball, and a high amount of pressure off it. The Samba Strike 3-4-2-1 followed shortly after, using the same defensive philosophies, but with a Brazilian flair in attack. FM16 and FM17 brought new challenges. The importance of physical prowess in modern day football has been clear to see, but the demanded style of football played is quite common across most teams in the top divisions. Fans want to see their teams play football which allows for a high amount of possession of the ball, with cute intricate passing moves. In FM, this resulted in a large proportion of oppositions playing their football around the middle of the park, waiting patiently to breach the opposition. José Mourinho remains an exception to this. This time, I resurrect the Hawk-Eye, but in an evolved form. On the ball, I wanted my team to be able to have good possession and be able to attack the channels between opposition defenders. Off the ball, I wanted to restrict the space behind my defenders, disallowing opponents from making too many runs behind, while also having a midfield, in front of my defenders, who would hustle and harry the opposition in to making a mistake through a high amount of clinically applied pressure. 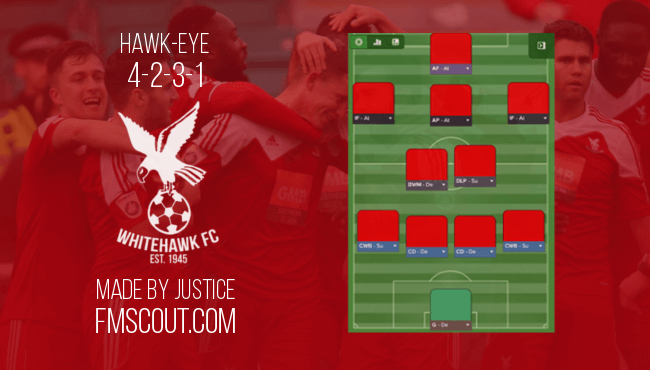 And so, I bring to you Hawk-Eye 4-2-3-1! As you can see, the formation used here is a very standard 4-2-3-1. A standard Goalkeeper is used behind two standard Central Defenders. Two Complete Wing Backs, with Support duties, flank the defenders. In midfield, a partnership of a Deep Lying Playmaker (S) and a Ball Winning Midfielder (D) is visible. An Advanced Playmaker (A) sits behind an Advanced Forward (A), with an Inside Forward (A) on either side. While the two Inside Forwards sit narrower and attack the central areas, the two Complete Wing Backs cover the wide spaces moving forward. Team Shape: This is how your team acts through each phase of the game. I usually always have my Team Shape set to Fluid. This means my players will assist in all parts of the game, but not overly so that they do not forget their individual duties. A fluid shape allowed for quick transition from phase to phase, but also made sure we were not lacking numbers in any department at one stage or another. Strategy: This is your mentality when you take on an opponent. This changes quite a bit for me, depending on the situation. I would quite often go with a Control mentality, in order to keep the opposition under pressure at all times, but I do often go for a Counter mentality to hurt the opposition with clinical counter attacking football. It all depends on the situation. For instance, I would be inclined to go Attacking in an away fixture of a two-legged tie, such as in the Champions League, so as to score as many away goals as possible. As I said, it depends on the situation. Tempo: We tend to play with a Higher tempo. We want to move the ball around quickly so as to find pockets of space and to be able to keep it away from the opposition. We do not want them to have the time to become organised in defence, otherwise we may possibly lose a goal scoring opportunity. Width: A Balanced width is used, so we do not focus on just one area of the pitch. We are able to compress the game to just the central areas, as well as stretch it out and use the spaces out wide. Defensive Line: Now, this is where the real magic starts to occur. A Slightly Deeper defensive line means that the opposition find it more difficult to make runs in behind the defenders, but they are not too deep that there is a major gap in front of them. In this height of line, the defenders can remain organised and settled, and then adjust to any situation which occurs in front of, or behind (very rarely), them. Closing Down & Tackling: While the defensive line offers solidity and a strong backbone, what happens in front of this defensive line is very important. More closing down is expected from the rest of the team. While the opposition linger on the ball in front of a solid line of defenders which they cannot breach, your midfield picks them off one-by-one with a high amount of closing down. This is supplemented by the instructions Prevent Short GK Distribution and Get Stuck In, in order to unnerve the opposition in their possession attempts. Build-Up Play: As said previously, this is a system which looks to Retain Possession, and this is done through Shorter Passing. This all stems from the moment the ball is in play, and so we look to Play Out Of Defence. It is important to make the most out of any advantage the opposition presents to you, and so you should look to Pass Into Space in order to make up any ground you can. But, there is no point squandering possession needlessly. Possession should be used with purpose and intent, but you should not look to lose it foolishly. This is why we try to Work Ball Into Box in order to create a good goal scoring opportunity, rather than have a few poor scoring opportunities. Creative Freedom & Freedom Of Movement: I like my players to use their abilities to the full when we are in possession of the ball. Modern day football has seen rise to 'free roles', most evident examples including Lionel Messi and Cristiano Ronaldo, while Zlatan Ibrahimović usually does his own thing. So, I like my players to Be More Expressive and to Roam From Positions, so they can impact the game in their own way. Football is all about expression, and it would just be robotic and monotonous without it. Goalkeeper: Here we have a Goalkeeper (Defend) between the sticks. We need somebody reliable who will not try to do too much on the ball, and can be called upon to make the saves when required. He is required to play it safe, but distribute the ball quickly, and to feet, in order to get moves going. Defender - Centre (Right): My two DCs are both Central Defenders (Defend). Their job is to protect our goal from opposition attackers at all costs. They sit deeper and don't move too far from the position. Organisation is important in this area, and they are very much required to create a strong and sturdy backbone. Defender - Centre (Left): My two DCs are both Central Defenders (Defend). Their job is to protect our goal from opposition attackers at all costs. They sit deeper and don't move too far from the position. Organisation is important in this area, and they are very much required to create a strong and sturdy backbone. Midfielder - Centre (Right): This guy is the Deep Lying Playmaker (Support). He is the guy who dictates the tempo of our team's play, and hopefully the game, from the middle of the pitch. He must have a very good passing range, and good vision to be able to see what is going on around him. He must also be able to put in a great defensive shift to keep with the philosophies of the tactical approach. Midfielder - Centre (Left): This guy is the Ball Winning Midfielder (Defend). He's the main defensive component of the team, and is responsible for leading the team's pressing on the opposition when they have the ball. He must be industrious in his defensive work, but must also have the skills to play a possession-based game on the ball. Attacking Midfielder - Right: Our two Inside Forwards (Attack) are responsible for attacking the spaces between opposition defenders, as well as the gaps in front of, around and behind the opposition back line. They are, in essence, two slightly wider, and slightly deeper, strikers, and should be skilled as such. Attacking Midfielder - Central: This is our Advanced Playmaker (Attack), and our primary creator of goal scoring opportunities. He will look to move in to pockets of space where he can get on the ball and create goal scoring chances for others, or even himself. He must be very technically skilled and have the flair to make the difference in the final third, but must also be able to press the opposition without the ball. Attacking Midfielder - Left: Our two Inside Forwards (Attack) are responsible for attacking the spaces between opposition defenders, as well as the gaps in front of, around and behind the opposition back line. They are, in essence, two slightly wider, and slightly deeper, strikers, and should be skilled as such. Striker: Here we use an Advanced Forward (Attack). The reason for this is that I want my striker to close down the spaces and the opponents when not on the ball and then to be pro-active on it for himself and for others. He is allowed to move out of position to get in to spaces where he can create and do damage and he links up well with the two IFs. Here is a sample situation where our team is defending an opposition attack. There are three distinctive sets of players marked by colours - white, red and blue. There are also zones marked with pink, which I will explain the importance of too. The White Area: This is the back four of our team. As you can see, they are lined up quite deep to make sure the opposition cannot make runs in behind. The DCL has the opposition striker in front of him, the DCR is shifting across to cover any diagonal run the striker could make in to that area, while the DL is in a position where he can stop the opposition player beside him from losing him, or stop the striker should he choose to run in to that zone. The DR has pushed forward to close down the opposition player on the ball, but only because the areas behind him are covered. The Red Area: This is the midfield of the team. It includes the DLP, the BWM and the AP. As you can see, they have the spaces in midfield very well covered. The BWM is slightly deeper, erasing the space around the two opposition players in that zone, while the DLP and AP are shifting across to deny space in other midfield sections. The Blue Area: These are the tree most attacking players of our team - the AF, and the two IFs. They don't do an awful lot of tracking back to defend, and instead only press the opposition's back line. They are, however, in strategic positions where they can use their pace to break behind the opposition on a counter, should the opportunity arise, or even to drop deep and hold up the ball, to link up play. The Pink Areas: These are the danger areas for the tactic. As the two IFs tend not to do an awful lot of tracking back, the two CWBs can become quite isolated while defending the wide positions. Should the player on the ball beat the DR in a one-on-one, he would have acres of space to move in to on the left wing, and gain a position where he could deliver a dangerous cross. 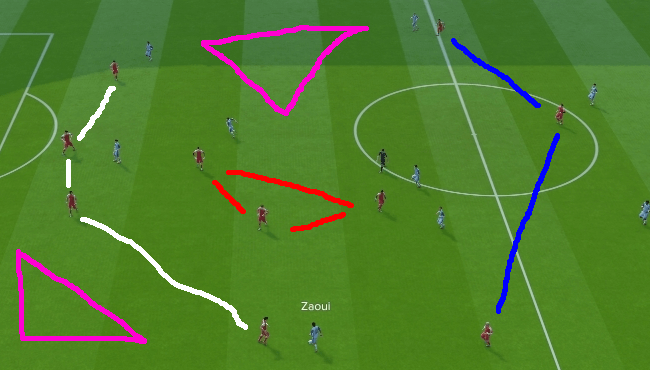 Likewise, were he to play a cross field ball in to the other pink area, the opposition could potentially have two or three players versus are lonely DL. So as you can see, this defensive structure is used to combat the trend in modern day football of attacking through the middle. Most teams attack this way these days but some are still old fashioned. José Mourinho's teams could very well pick apart this system, so it is not error-free. But, NO TACTIC IS FLAWLESS!!!!!! Every thing has a flaw, and I just wish to make you guys feel aware of the flaws in this one. This tactic does not guarantee results. No tactic guarantees results. There is no such thing as a 'Plug & Play Tactic'. They are non-existent. Every tactic has its flows, some more so than others. I presented to you both the strengths and the weaknesses of this tactic in order for you to fully understand why things happen the way they do. 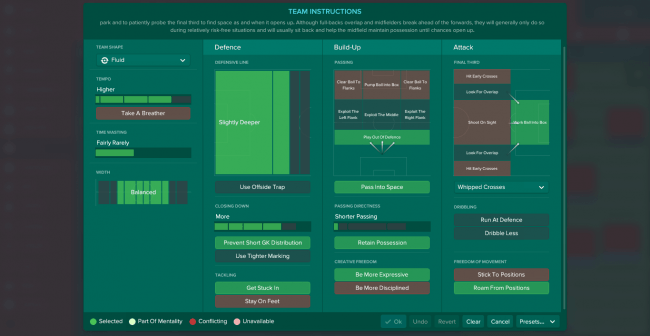 If you are looking for results I have earned using this tactic, you can take a look at my FM story. I do not intent this to be a way of advertising it, but I just do not think it would be worth posting eleven seasons' worth of results here in to this little article. 9 comments have been posted so far. Kikijones2001, of course it can! That's the beauty of tactics - you can rework them to fit how you want to play. There is no set way of playing, so of course anything can be altered. As I have said in a previous comment (scroll down to see), you must always consider the pros and cons of such a switch, but I cannot tell you how and how not to play football manager. I can only tell you how I play it. Would the AMR work as a winger too? Liisandroo, you can find training details in the Development section of the article. What 'instructions' are you asking about, if I may ask? @einherjer83, I tend to just keep match training set to Match Tactics, although I might alter that to Defending/Attacking set pieces depending on opposition. As for opposition instructions... personally I tend to have the GK closed down, as well as any Attacking Midfielder/Striker. Hard tackling on any midfielder & attacker, and show the wide players & attackers on to weaker foot. Good luck with it anyway! Have really been struggeling to find a good tactic for Fulham (season 2029/30). But are there any OIs and match training? attacking/defensive etc? Will try this one. Looks pretty solid! Despite the challenging result against Huddersfield, i will keep this tactic one of others. However, i have unticked "shoot more often" option for Advanced Forward due to shooting the mountains. And i have unticked the "dive into tackles" due to high amount of yellow cards. @fanarin, of course you can always alter the roles to suit your team, any tactic is just a canvas which you can then paint your own work on to. But, you must always consider what happens, both positively and negatively, when you alter something. Using a Complete Forward will allow your striker to be involved in more aspects of play, but will he then show the same emphasis on scoring goals, and being in the position to score these goals? The same question must be asked of a False 9, albeit it is a different role to the Complete Forward; will he be in the position to score as many goals? Can the change be positive in creating goals both for the striker and his team mates? I'm not being negative of the idea of the change, of course, as it can always work. Insanity would be trying to make the same tactic fit exactly for every club, so of course changes may be needed from time to time. So, feel free to try some alterations, but always be wary of how it changes things! Good luck! seems very promising and well explained. thank you. may I use it with CF or False 9 ?